Shmittah and the Messiah: Could This Be the Year Before His Arrival? Many readers were interested in his statements and wondered about the source for the Rabbi’s insistence upon connecting the coming of the Messiah with the year after the Shemitah, the Sabbatical year. The issue takes on particular urgency since the current year is a Sabbatical year, ending September 13. Sources close to Rabbi Kanievsky explain that he is not making a prophetic statement predicting a certain time period. The Rabbi is simply relating to well-known classical sources on the subject that discuss the Messiah and place it in a specific time-frame. According to the sources, the year after the Shemitah has a special significance relating to the Messiah. There is a possibility, perhaps even a probability, the Messiah will come the year after the Shemitah, though if he does not, it in no way negates or contradicts the Rabbi’s statements. This requires a bit of explanation. This year, 5775 in the Jewish calendar, is a Shemitah year. The Shemitah comes every seven years, making it a form of Sabbath that occurs on a yearly, rather than a weekly, cycle. The Sabbath is generally characterized by a cessation that signifies accepting God’s greater authority in the world. Practically during the weekly Sabbath, this means a cessation of labor, showing that despite spending six days working for the material, we stop on the seventh day to show that God is the true master. The same is true for the Shemitah year. We work the land for six years, and on the seventh, we leave the land fallow and the fields are left open for anyone to come and take of the fruit. There are several other cases of cycles of seven that are related to this, for example the seven year cycle of a Hebrew slave before he is set free, as described in Exodus 21:2. Another aspect of the Shemitah year also has implications for loans, for the same reason. Shemitah was commanded to Israel at Mount Sinai. After 40 years in the desert, the Jews entered the Land of Israel, but the land must be owned in order for it to be forfeited as the verse specifies. So 14 years later, after they had completed conquering the land, they began counting the seven year cycle. The first Shemitah year was the 21st year after the Jewish nation had entered the land. The Shemitah is part of a larger framework of seven Shemitah cycles, in which we count 49 years, and then the 50th year is the Jubilee year, as described in Leviticus, chapter 25. The Jubilee year is observed only when all of the Nation of Israel is in the Land of Israel. Therefore, when the Jews returned from Babylonian Exile, since many chose to remain in the Diaspora, the Jubilee was not observed. For the same reason, it is not observed today in modern Israel. It is interesting to note that despite the initiation of the Shemitah year being determined by the actions of the Jews, it worked out that the first Shemitah year was a multiple of seven since the creation of the world, according to the Jewish calendar. The year after the destruction of the Second Temple, 3829, was also known to be a Shemitah year, 547 seven year cycles since the creation of the world. The current Hebrew year is 5775; precisely 825 Shemitah cycles. Rabbi Kanievsky was, of course, familiar with this source and was aware we are now in a sabbatical year. His instructions to come to Israel took into account that there was a much greater chance that the Messiah will be coming next year. It is interesting to note that Rabbi Kanievsky was very diligent about observing the Shemitah and ruled by more stringent rulings concerning this Biblical commandment. It is clear that Rabbi Kanievsky was relating to Babylonian Talmud, which says specifically that the Messiah will come in the year following the Shemitah. Whether it will come after the Shemitah year we are presently about to complete has yet to be seen. What is undeniable is that there is a clear significance to the time period immediately following a Shemitah year in terms of national redemption. 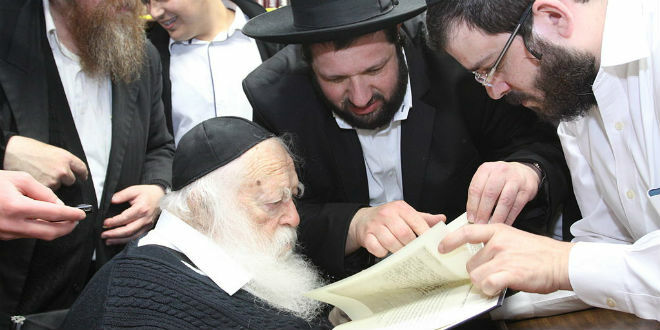 Rabbi Kanievsky called upon people to do Tshuva, repentance, that leads to a return to faith and good actions in order to actualize the unique potential for redemption that is within us right now. If our actions are correct and coincide with God’s will, then the Messiah will come.